The Cardigan Welsh Corgi is full of energy and even tireless at times. It makes a great companion as a house pet due to its devotion to its owner. Due to this loyalty, it may be distant with people that enter the home that it does not know. The Cardigan is an agile entertainer with an underlying relaxed attitude. It does have the inclination to bark and may confront other dogs as well. While the Cardigan Welsh Corgi is a relatively small dog, it requires a significant amount of physical activity. These exercise requirements are able to be achieved through energetic walks or play time. In the past, the Cardigan Welsh Corgi would meet these demands through herding sessions. As it does enjoy physical activity, the Cardigan is best suited for a home where it can have access to both the home and a yard. It can also tolerate temperatures that are mild to cool, making it a dog of all seasons. The Cardigan makes a good pet for the home, but will need its coat maintained with brushing approximately one time per week for the removal of dead hair. One of the major health concerns for the Cardigan Welsh Corgi is canine hip dysplasia, also known as CHD. This involves a defective or atypical development of the hip in the dog. A minor concern for this breed is degenerative myelopathy, which is a disease that involves the spinal cord. Occasionally, PRA, or progressive retinal atrophy is seen in the Cardigan, as well as urinary stones. In order to prevent or catch these concerns early on, it is important to regularly test the hip, eye, and even the DNA of the Cardigan to make sure there are no signs of any issues. Pending no health problems, the average life span of the Cardigan Welsh Corgi is 12 to 14 years. Centuries ago, the Cardigan Welsh Corgi made its appearance in Cardiganshire, South Wales. It made its way to Cardiganshire from central Europe and was one of the first breeds to make way to the British Isles. It is believed to have been a deviation of the now extinct English turn-spit dog, which had short legs and a low body. The Cardigan originally found its place on the farms. It was used by tenant farmers to drive, as opposed to herd, cattle across land to increase the amount of acreage that the cattle occupied, thereby increasing the land available to the farmer. The Cardigan would spread the cattle out by nipping at their heels, while avoiding repercussion by ducking their kicks. Once the lands eventually became divided and sold, the Cardigan no longer had a purpose on the farmlands and instead became a luxury dog in the home that few could afford. Because of this, it almost faced extinction. While there have been many cross breed attempts, it appears as though only the cross with the brindle herder has proven successful and has yielded today’s Cardigan’s. The first Cardigan Welsh Corgi’s measured about a Welsh yard in length from their nose to the tip of their tail, earning it the nickname of the yard-long dog in parts of Cardiganshire. It did not begin its endeavor as a show dog until 1925 and did not arrive in America until 1931. 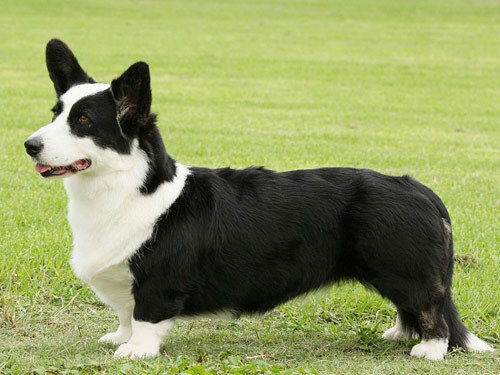 The Cardigan Welsh Corgi and Pembroke Welsh Corgi had previously been considered one breed until the AKC recognized the Cardigan Welsh Corgi as its own breed in 1935. Today, the Cardigan remains less popular then the Pembroke for reasons that are unknown.